We then gave this same paint effect to the metal trim that we took off earlier. We purchased another mirror with the same dimensions as the original; this one being flat and suitable for everyday use. Once the frame and trim were completed, we put in the new mirror and replaced the trim. To paint the roses, we again used the Old Gold and copper paints and a fine paintbrush to get into the very center of the rose. We used the same principles as for the mirror, finishing with a dab of green on the edges. Once the paint had dried, we glued the roses around the mirror. 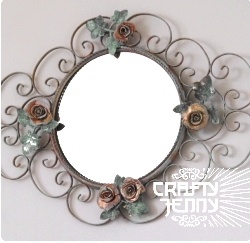 As our mirror already had leaves on the trim, we positioned our roses there, but alternatively we could have made more and placed them right around the actual mirror. We think our mirror is now more gorgeous than ever!